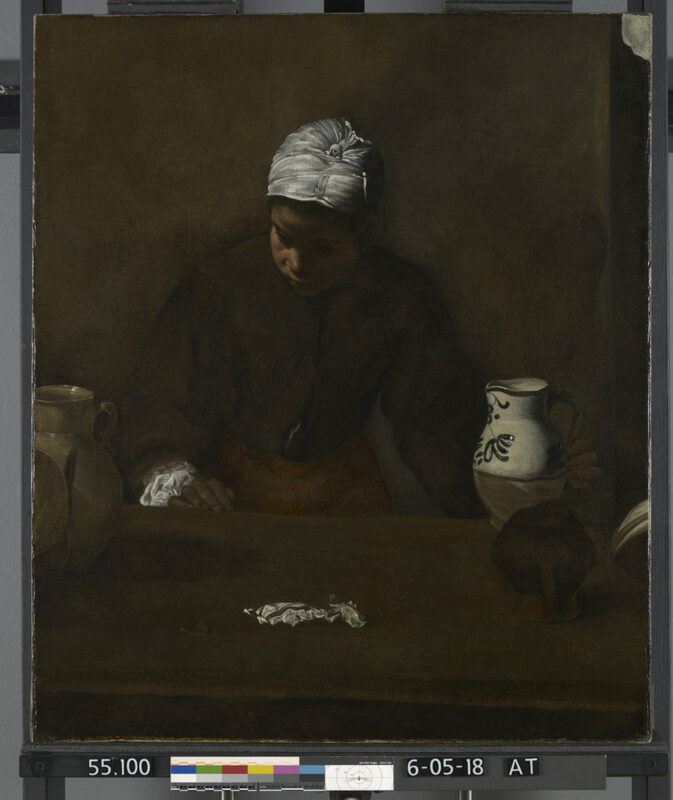 In recent days, the Museum of Fine Arts in Houston has rehung a painting called Kitchen Maid (c. 1620) with a new label, “attributed to Velazquez.” The work used to hang in its decorative arts mansion, Rienzi, partially blocked by a door! At that point, it was labeled “in the style of Diego Velázquez.” It was donated to the museum by Carroll Sterling Masterson and Harris Masterson III in 1955, and later when then donated their home–Rienzi–it remained behind the door. The change was, of course, precipitated by a lot of work, as I outlined in an article for The Art Newspaper. It was published several days ago, but I’ve been far away, in Ethiopia, on a vacation and am just catching up now. This reattribution—giving the museum its first painting by the Spanish master—is the result of new conservation and research by the institution’s chief paintings conservator, Zahira Bomford, a Velázquez specialist who thought that the face in particular “had a beautiful quality” and might be by the artist. When she removed layers of wax, resin and repainting that marred the painting and completed various technical studies, she and others at the museum became convinced that her hunch was true. …The Houston painting seems to be a cropped version or a fragment of Kitchen Scene (1618-22) by Velázquez, owned by the Art Institute of Chicago, and also shares components with his Kitchen Maid with the Supper at Emmaus(around 1617-18) at the National Gallery of Ireland in Dublin. Bomford says that the head and upper torso coincide in the Houston and Chicago paintings, for example, and that some pieces of crockery match those in the Dublin painting. Some elements in these works also appear in other paintings—for instance, the crockery is seen in his Two Young Men Eating at a Humble Table (1622) at Apsley House in London. Equally important, Bomford’s work lends credence to the recent theory that Velazquez “used “manual copying aids”, or cartoons, to create many of his works. But that was not the case, she concludes, “in the generation of his most sublime images”, such as Las Meninas (1656).” She elaborates on that in an article recently published in the Colnaghi Studies Journal. It is most interesting how a “brand ” name attribution can change the life of a painting . Speaks volumes on the human condition.